It would have been more appropriate to have arrived at Wivenhoe by boat, given its centuries-old boat-building history. By train, it’s a stop beyond Colchester on the Colne estuary. Not carrying my phone, I was generously given a printed set of directions to James Dodds‘ address by the woman in the ticket office. I wandered southwards through the quiet town in the gentle early autumn afternoon sun, which reflected across a very still river. The wet dock information board (illustrated by one of James’s topographical prints) pointed to more turbulent times – Vosper and Thorneycroft made motor torpedo boats here during the Second World War. I spotted James’s trademark largish boat paintings in his quayside studio before I saw the man himself. We shook hands and he led me to his other – printmaking – studio. Boy in a sweet shop is the best way to describe my enthusiasm for what I could see. James gave me a demonstration of his main printing press – an 1890s’ Jardine treadle platen press, which he acquired in 1986. His Jardine Press imprint began life soon after with The Wanderer, a translation of Anglo-Saxon verse by poet Kevin Crossley-Holland illustrated by James. Making handmade editions on vintage presses is labour intensive – a week to set a page of lead type – so that eventually James decided to use commercial printers for producing books, which were often collaborations with local poets. Originally, the printed pamphlets and books were a way of demonstrating to a wider audience what the young James Dodds could do – the German Renaissance artist Albrecht Durer did the same thing from his Nuremburg studio 500 years ago. For his linocuts, James uses a 1950s Western proofing press, which he also acquired in 1986. He gave me a second demonstration using thick German mould-made paper, which is then hung to dry in his small studio. But as he told me, the real hard work is in the drawing and cutting of the Lino block – drawing first with chalk and then pencil, pen and white paint to hone the image. The finished Lino is itself a complex piece of art – he often works from photos and, by necessity, reverses the image so that printing restores everything to its right and proper place. Born in Brightlingsea, further down the Colne, James’s first job was as a mate on the Baltic trader, Solvig. 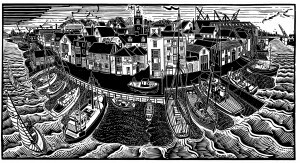 He was then apprenticed to the Maldon ship builders, Walter Cook & Son, before doing a foundation year at the Colchester School of Art and then moving to London to study at the Chelsea School of Art and the Royal College of Art, graduating in 1984. As we chatted further, I came to realise that James Dodds is deeply rooted in this quiet part of East Anglia. He is also a man of many contrasts: printmaker and painter; builder and artist; and with an eye to the past, but firmly in the present. For the future, shipbuilding at Wivenhoe has all but come to an end, but James’s work continues. 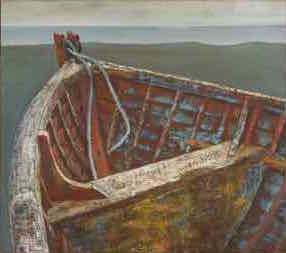 On the near horizon are exhibitions at his London gallery, Messum’s, which runs from 11-28 March 2015 and at Hayletts Gallery in Maldon on the Essex coast in November 2015.